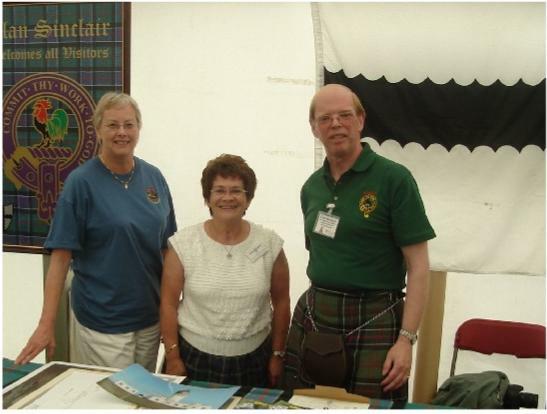 The Clan was represented at the Inverness Games, and were visited by Clan Sutherland. Rt Hon The Earl of Caithness PC is pictured here with Jeanie Sutherland and Jean Sutherland (centre) who very kindly sent in the photograph. We have managed to restore the whole website today after a "technical hitch". If you find anything amiss please contact the Webmaster. With a selection of photographs © by Clan Photographer, Brian Finch. Here is an external link to the first photographs from the 2005 International Gathering on the webmaster's own site. Many more to come. See also the Sinclair Discussion Group's Photo Section (very soon) and Lisa S.C.'s. The latest itinerary has been posted click here. The Committee of the Clan Sinclair Society in Caithness has chosen the above as the official logo for this summer's International Gathering in Caithness and Orkney. For further details of the Gathering click here.